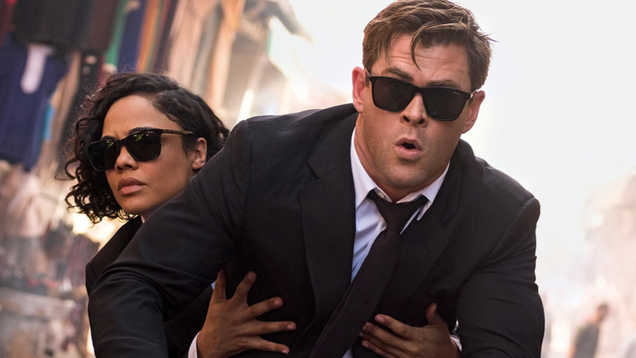 When Thor: Ragnarok co-stars Tessa Thompson and Chris Hemsworth reunite on the big screen in F. Gary Gray’s upcoming Men in Black: International, they’ll introduce audiences to a whole new side of the MiB. But the heroes’ greatest threat is actually going to be someone they might already be more than familiar with. As every Star Wars fan knows, Hoth is cold. The ice planet from Star Wars: The Empire Strikes Back is a frozen tundra, home to yeti-like wampas, and so frigid that tauntauns just keel over. Tatooine, it is not. On location in Norway during production in 1979, the Hoth scenes were filmed in the remote town of Finse, often buried in snow, and surrounded by glaciers and avalanche-prone mountains. 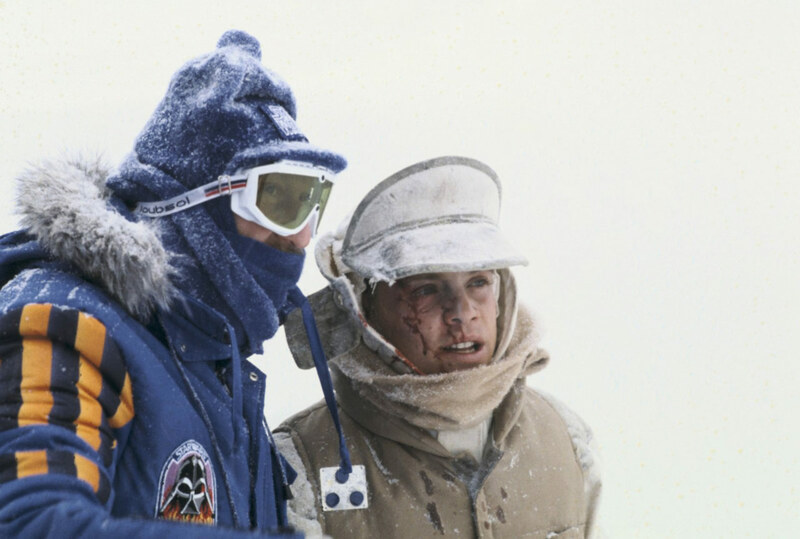 So, Hoth was actually real-world cold. If you look at behind-the-scenes photos from Empire‘s Hoth sequences, you’ll notice that everyone is bundled up. 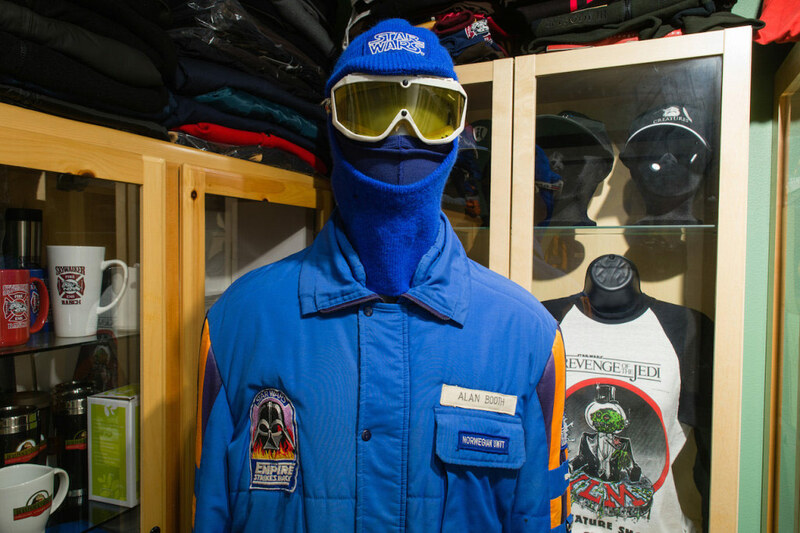 To protect them from the harsh elements and blizzard conditions, cast and crew members were issued custom gear, including goggles, caps, and snow pants. But one item in particular stands out: that jacket. Mark Hamill, Carrie Fisher, and producer Gary Kurtz in their Empire crew parkas. 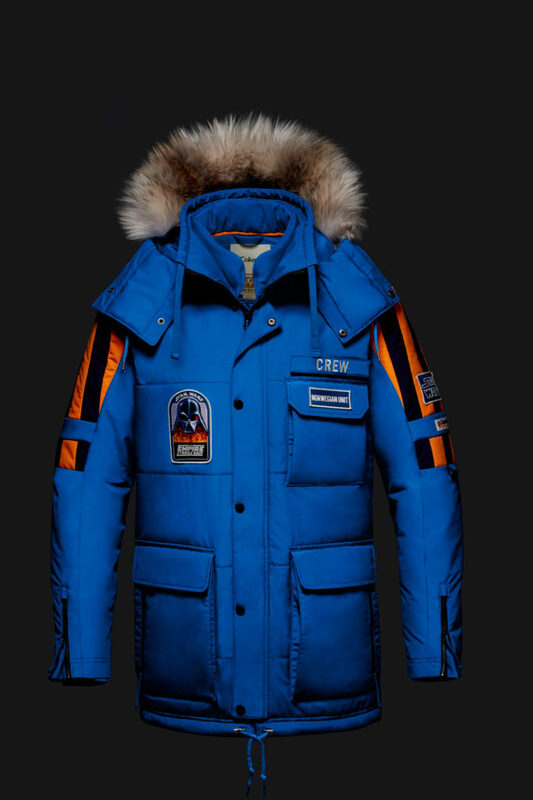 It’s a bold blue parka with popping stripes on the upper sleeves, a custom nameplate above the left pocket, and other Star Wars-themed details, including a patch on the left arm and, finally, the coup de grâce: a hauntingly cool “Vader in flames” on the front chest. 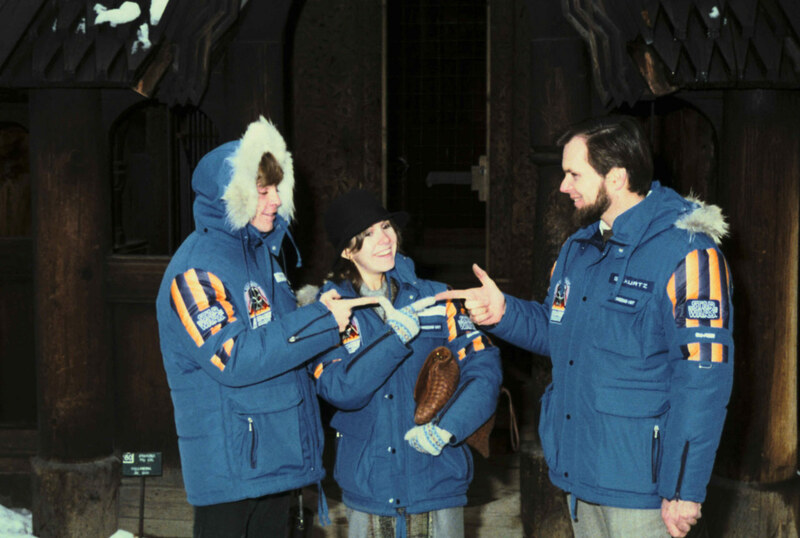 The Empire parka was crew gear (custom-made, branded apparel for those working on a film) before there was crew gear, and Harrison Ford, Mark Hamill, Carrie Fisher, and director Irvin Kershner all wore it. As such, it’s become a holy grail among collectors. They’re incredibly hard to find, as only a few dozen were made and even fewer are known to exist today. If you ever liked the jacket’s style or wished you could have something like it, you’re in luck. 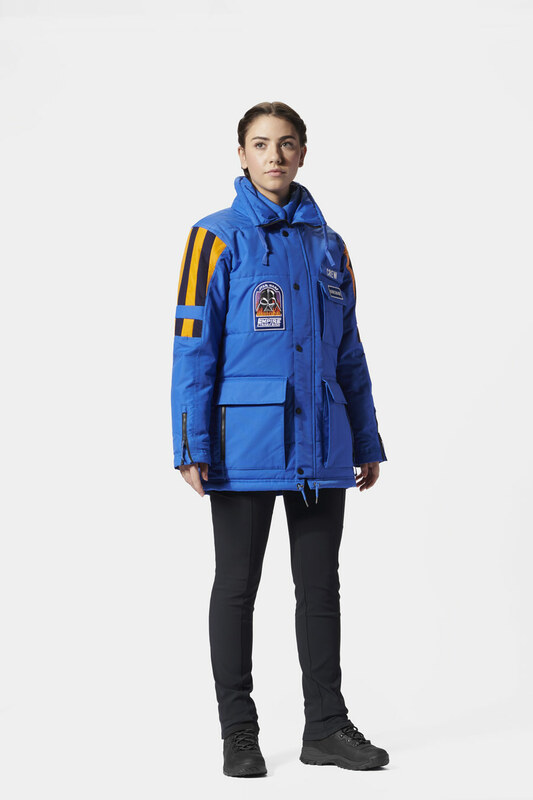 Revealed today, Lucasfilm and Columbia have teamed up to create the Star Wars: Empire Crew Parka, a limited-edition jacket inspired by the famous on-set winter outerwear, available for $500 starting December 7. The coat blends modern tech into the parka’s classic look, features a super-cool Vader patch in the style of the original, and includes a few surprises. In the past, Lucasfilm and Columbia have collaborated on movie-themed jackets, including recent releases inspired by Rogue One and The Empire Strikes Back. Those items, however, were character based. This year, they wanted to do something different. Director Irvin Kershner with Mark Hamill, post-wampa attack. 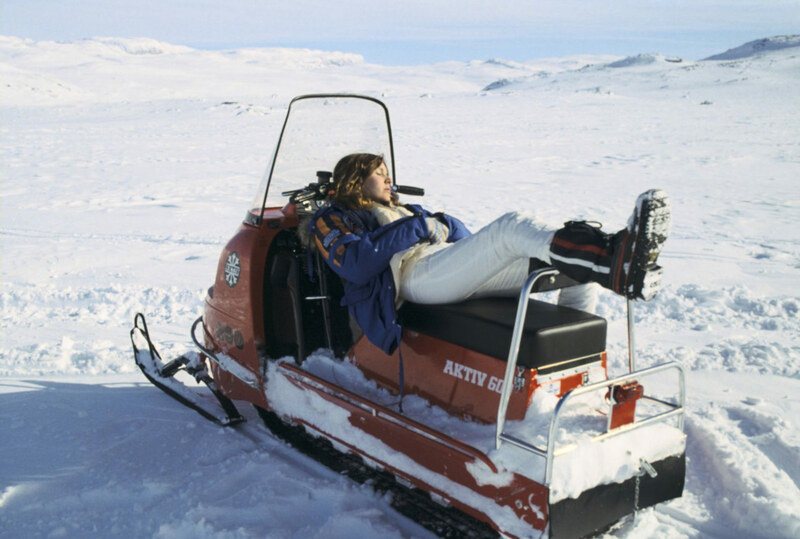 Snow day: Carrie Fisher takes a break on set. With that, Prince’s team and the designers at Columbia were off. They loved the colors of the jacket and the fact that they were different than what fans might otherwise associate with Empire (“It’s associated with the production, and that’s kind of cool,” Prince says), and were excited that developing their own version would shine a light on a bit of Lucasfilm history. Then the real work had to begin. 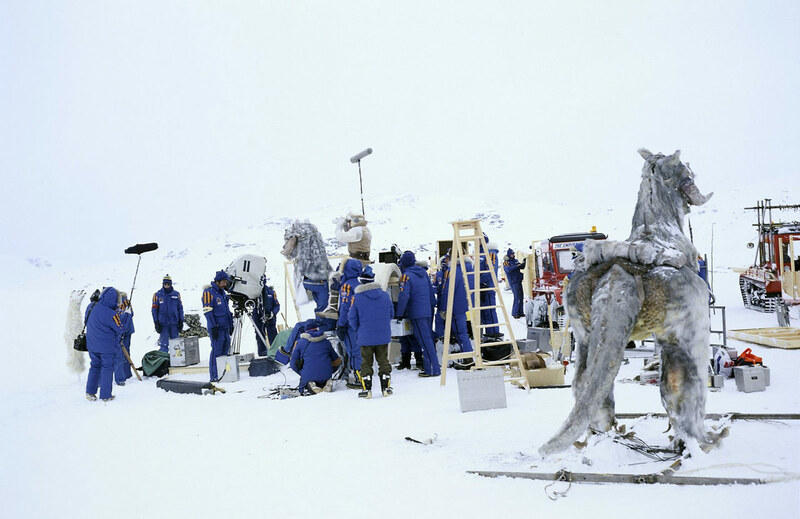 The crew shoots Empire‘s opening scene, while a tauntaun waits its turn. As it turns out, the company that made the jackets no longer exists. More photos were discovered. And Lucasfilm and Columbia found they had clearance to create their own version of the parka. Only one thing remained: getting their hands on an original. “We had to look and see, well, who actually owns one of these jackets,” Prince says. “We want to look at it, we want to see it inside out, look at all the details.” Through some internal resources, they found someone: Gus Lopez, one of the world’s biggest Star Wars collectors, who actually owns two. “I remember as a kid going, ‘I would totally want one of those jackets someday,’” Lopez tells StarWars.com. 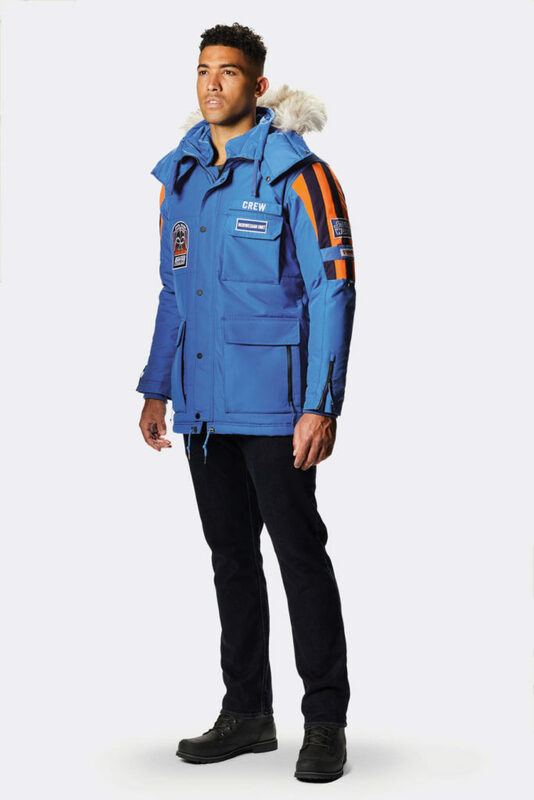 “One of the areas I specialize in is cast-and-crew items and, for me, it’s the top cast-and-crew piece ever for Star Wars.” Lopez acquired his first Empire parka about 12 years ago after putting word out in the collector community, and purchased a second jacket, framed, five years ago. When he was contacted by Lucasfilm for this project, he didn’t hesitate. Collector Gus Lopez’s original Empire crew parka and associated gear. 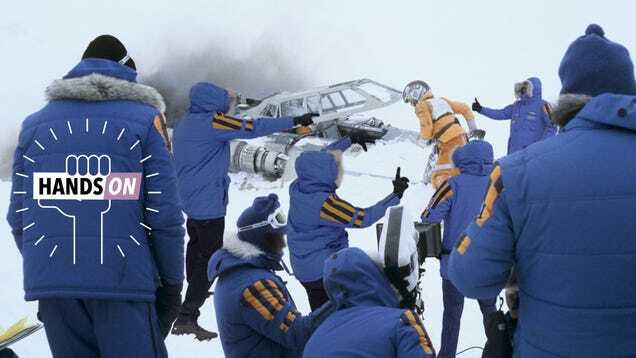 In creating what would become the Star Wars: Empire Crew Parka, Columbia and Lucasfilm didn’t want to make a simple reproduction, or something that was stuck in the past. “It was important to us to make something that felt authentic but not necessarily a direct replica, that had that Columbia appeal,” Prince says. 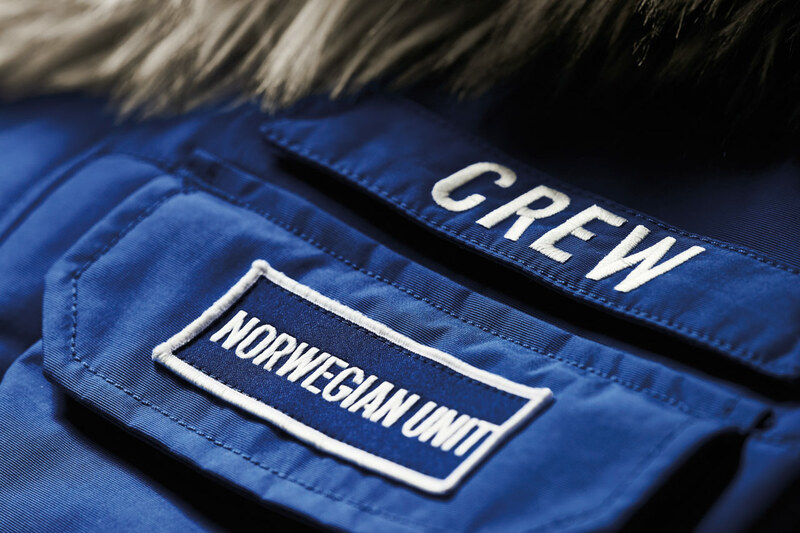 “We wanted to make a true, functional piece of outerwear.” The goal was to design something that was definitely identifiable as the Empire crew jacket, but modernized, incorporating all the advances that the fashion industry has seen in the intervening years. “It was a fun challenge to maintain the overall feel and heart of the original design, but bring it into 2018 with Columbia’s technologies and fabrications,” Roundy says. She worked to maintain the look of the exterior and its fabrics, keeping the original’s now-retro sensibility, but bringing the warmth-factor to today’s standards. “You open up the jacket, and that’s where all the incredible technology comes into play,” Roundy says. “And you go, ‘Oh!’ That’s where the newness and the modernity are coming in.” Indeed, Columbia’s parka is waterproof, breathable, and features a seam-sealed outer layer, along with the company’s patented inner Omni-Heat thermal-reflective lining and insulation. 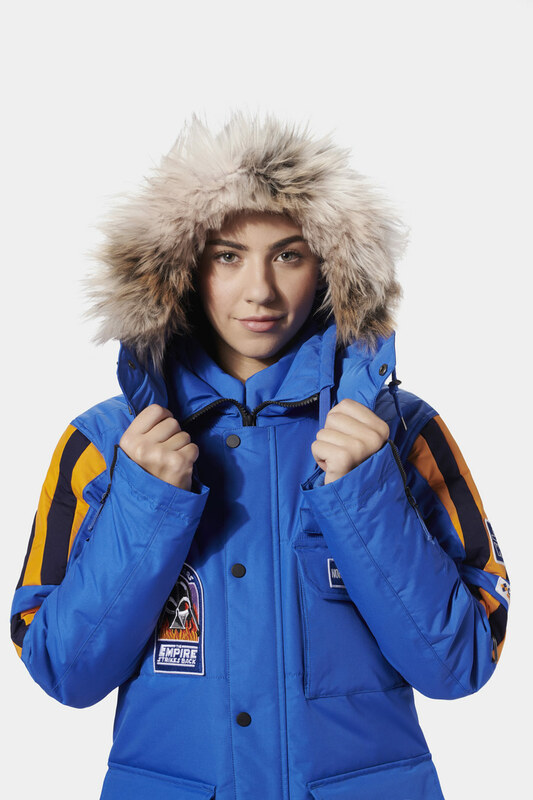 It features a removable, adjustable hood with removable faux-fur trim, two-way collar, ribbed comfort cuffs, wrist zips, and multifunctional pockets. Then, there’s the patches. 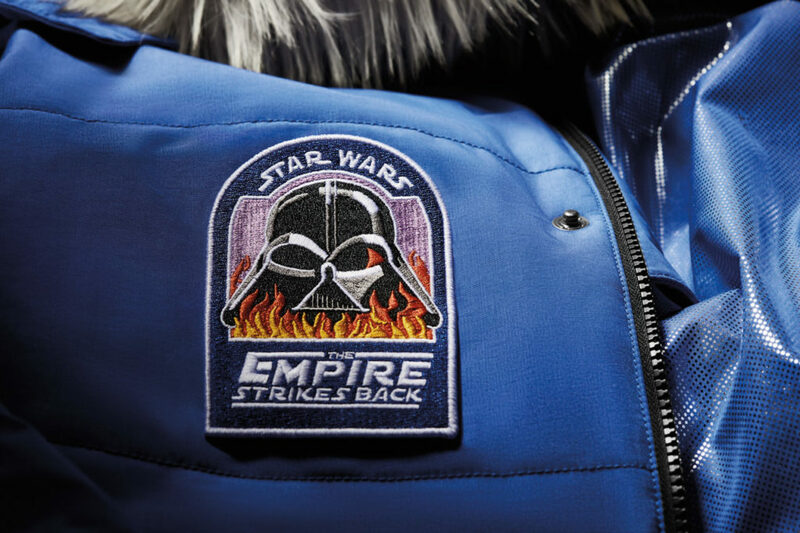 The Star Wars: Empire Crew Parka wouldn’t be complete without the patches seen on the original jacket, including the Star Wars patch on the left arm, and especially the Vader emblem on the upper right chest. “We sent out art to the factory to follow, and originally, with that Darth Vader patch on the front, we were going to modernize it with a new weave structure,” Roundy says. 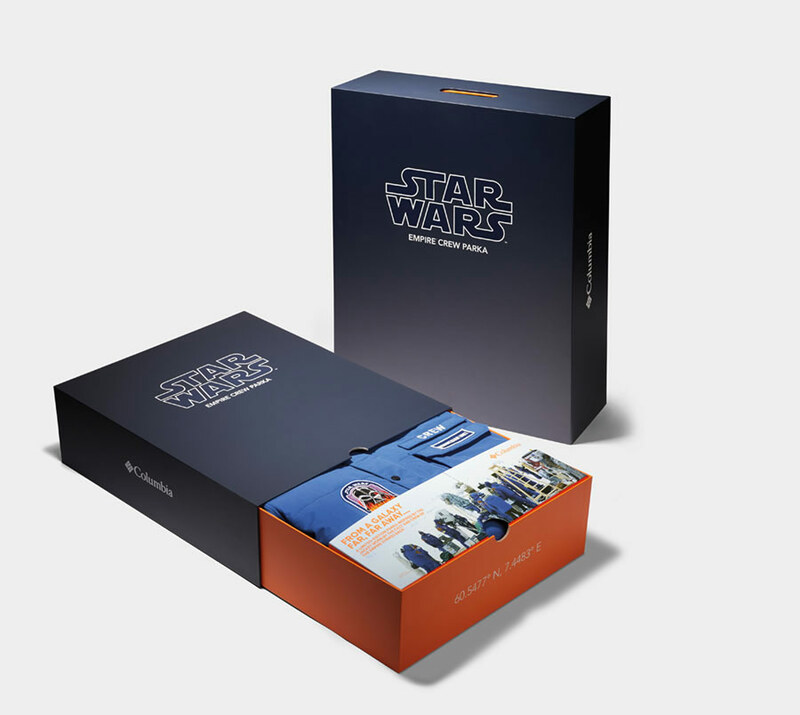 “But ultimately, we as a team in collaboration with Lucasfilm, decided that making these more retro to pay homage to the original was really the right call. 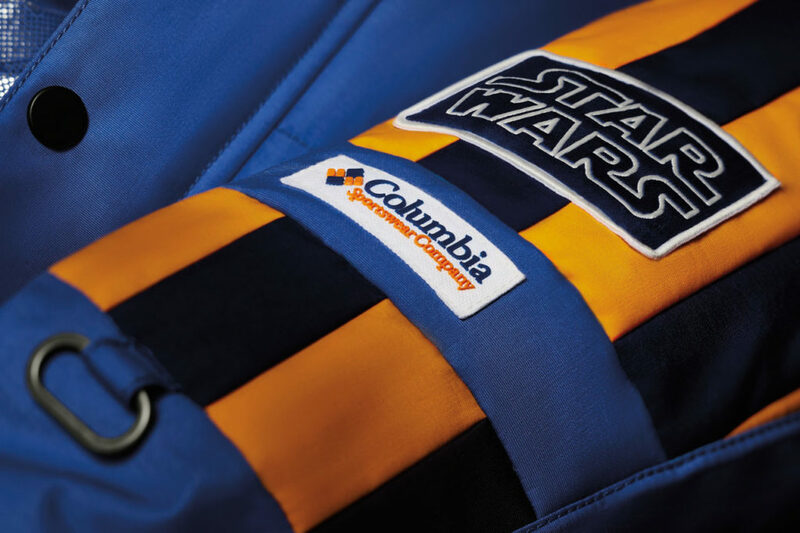 And I think it was, because they turned out awesome.” Columbia didn’t stop there when it came to patch authenticity; thanks to a Velcro patch on the upper left chest, fans can customize their parkas with their own names — just like the crew. The finished jacket is an effortlessly cool piece of fashion that is both of yesterday and today, and a tribute to those who made one of the world’s favorite movies. 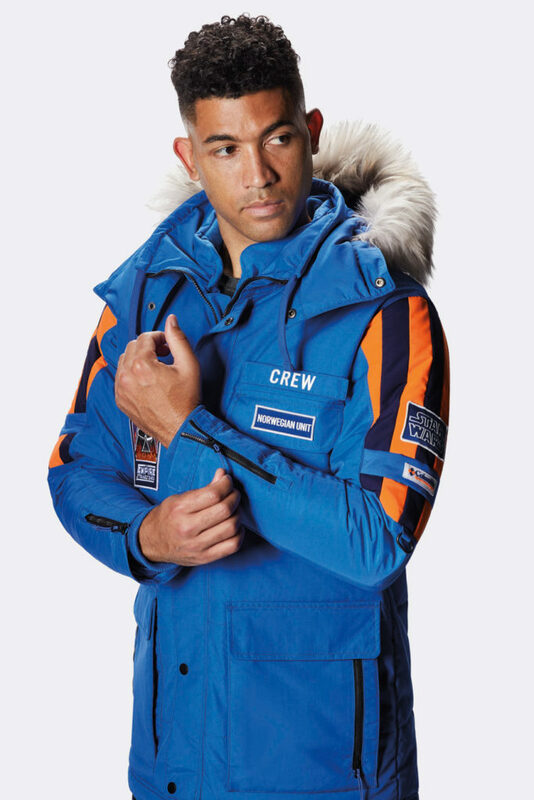 The Star Wars: Empire Crew Parka will be available beginning December 7, 2018, at Columbia.com/StarWars and in-store at select Columbia-branded retail locations in the U.S., Canada, Europe, China, Hong Kong, Japan and, Korea. Mark Hamill has signed 30 Star Wars: Empire Crew Parkas for a good cause. These signed jackets will sell for MSRP of $1,980 — a nod to the film’s release year — with all proceeds going to college access programs and scholarships. 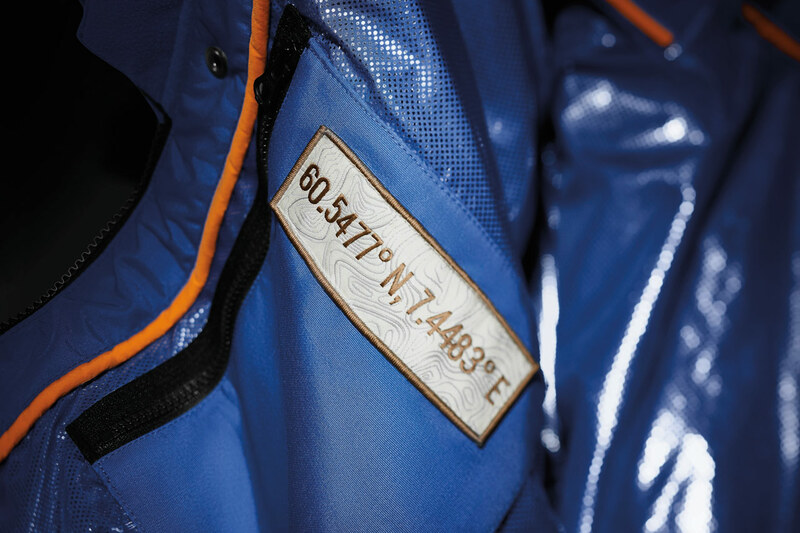 These coveted signed jackets will be sold only at Columbia-branded retail locations in New York, NY; Buena Vista, FL; Downtown Portland Flagship, OR; and Seattle, WA.